This New York Times bestseller is a memoir for anyone who has ever fallen in love in Paris or with Paris. This is a memoir for anyone who has ever fallen in love in Paris, or with Paris. PARIS: A LOVE STORY is for anyone who has ever had their heart broken or their life upended. In this remarkably honest and candid memoir, award-winning journalist and distinguished author Kati Marton narrates an impassioned and romantic story of love, loss, and life after loss. Paris is at the heart of this deeply moving account. Marton paints a vivid portrait of an adventuresome life in the stream of history. Inspirational and deeply human, Paris: A Love Story will touch every generation. This reading group guide for Paris - A Love Story includes an introduction, discussion questions, ideas for enhancing your book club, and a Q&A with author Kati Marton. The suggested questions are intended to help your reading group find new and interesting angles and topics for your discussion. We hope that these ideas will enrich your conversation and increase your enjoyment of the book. Paris has been a significant place for journalist Kati Marton throughout her life. She first landed in the City of Light in the fall of 1967 as a bright-eyed student and soon discovered the art of Utrillo, the films of Godard, and the music of Dvorak. She also learned of political turmoil and unrest during the student uprisings of 1968. Ten years later, Kati returned to Paris as a foreign correspondent for ABC News. This time the city was a place to fulfill her ambition and facilitate her career. She met the dashing and charismatic Peter Jennings and embarked on a passionate and tumultuous love affair and then marriage. When Kati next headed to Paris she was in the midst of a painful divorce from Peter, and she met Ambassador Richard Holbrooke, the lasting love of her life. Through the glamour and the heartache and the successes and failures, Paris has been Kati Marton’s touchstone—a place of new beginnings, a place of passions and pleasures, a place to rejuvenate, and a place to connect with her true, best self. 1) Kati writes of discovering art and music as a young person in Paris. Is there any piece of art or music that moved you when you first encountered it or that has made a lasting impression? 2) During Kati’s passionate early love affair with Peter Jennings she did reckless things to be with him, like traveling from Amman to Jerusalem to have dinner (p. 77). Have you ever done anything reckless or extreme in the name of love? 3) Does Kati’s job as a foreign correspondent sound exciting to you? Is it a lifestyle you would enjoy? 4) Is there any city or place that you love or that was as formative for you as Paris has been for Kati? 5) Have you ever had a romance that was fuelled or challenged by the commitment to career in the way that Kati and Peter’s was? Have you ever had to choose between ambition and love? 6) While in Budapest writing an article for The Atlantic, Kati discovers she is Jewish. Do you know the story of your own ancestry? Does your family or anyone you know have a story of discovering something surprising about their heritage? 7) Once Kati has children with Peter, she finds it tough to balance work with full-time motherhood. Have you had to negotiate that balance? How have you made it work? 8) Richard told Kati that he knew for years that she was just right for him and that he waited for her and anticipated the dissolution of her marriage (p. 117). Have you known any love like this? Do you or anyone you know have a similar story of knowing when a person was the perfect match? 9) Do you think that the personal qualities that made Richard such a skilled diplomat also made him a good romantic/life partner? 10) Kati writes of having specific shops and restaurants that were hers and Richard’s favorite places, places they frequented and thought of as theirs. Do you have any such place that you think of as especially belonging to you and a partner? 11) In dealing with the situation in Bosnia with Milosevic, Kati recalls Richard accepting for the first time that there is true evil in the world (p. 131). Do you agree? 12) Have you been to Paris? Does Kati characterize it the way you would? Do you agree or disagree with any of her characterizations of Parisians or their culture? 13) When Kati returns to Paris after Richard’s death she spends a lot of time in cafes writing. She says cafes are “the finest places for people alone not to feel lonely” (p. 181). Do you agree? Do you have places where you go when alone so as not to feel lonely? 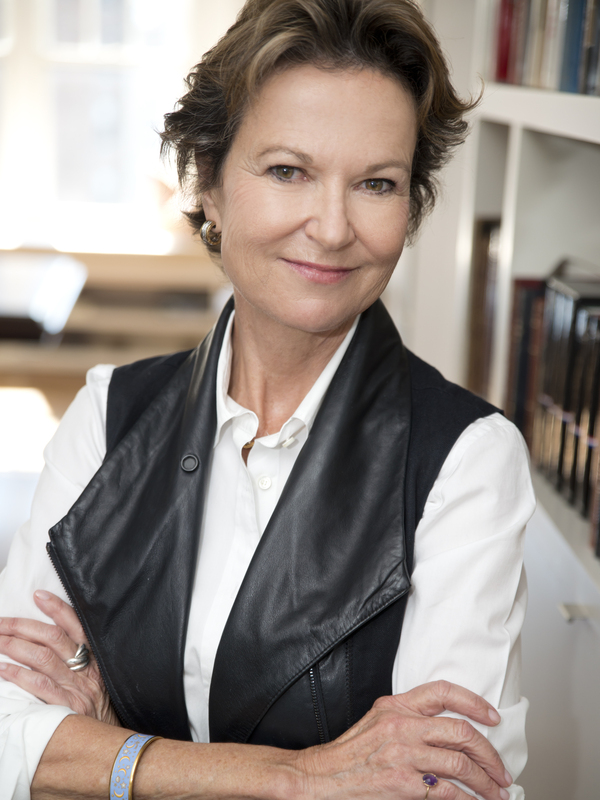 1) Read one of the authors Kati often quotes on Paris: Montaigne, Hemingway, or Proust. Discuss their portraits of Paris and of humanity. 2) Find a recipe for croissants, baguette, or any other favorite French dish and bake or cook! 3) Get out a map of Paris and pinpoint some of the spots Kati enjoyed as a student and with Peter and Richard. 1) How were the professional cultures of ABC and NPR different? The NPR culture was young and informal and there was plenty of scope for rapid advancement. Within a few weeks of being hired as a researcher I was handed a tape recorder and told to cover a news briefing at the State Department. Thus, I became All Things Considered’s first diplomatic correspondent. I was able to do long interviews with newsmakers – I mean half an hour long if it was interesting enough. It was a wonderful, wide open place where you felt the thrill of being part of something new that you could help to shape. I was in my early twenties and I was having the time of life while still working on a graduate degree in International Relations at GW University. It was a whole different scene at ABC News. This was a well-established organization, top heavy with super stars like Barbara Walters and Peter Jennings (my future husband). I was the newest and least experienced foreign correspondent and I lived day and night at the mercy of the New York assignment desk. It was a highly competitive environment and not an ideal place to be conducting a passionate love affair with the network’s soon-to-be star anchor. But I covered some amazing stories, including Civil War in Zimbabwe, and spy swaps in Cold War East Europe. I had a great ride. 2) Do you have any advice for readers on how to balance motherhood with ambition and career? Balancing motherhood and professional ambition is never easy. It wasn’t in the ‘80s or ‘90s and it isn’t now. I always felt that I was letting somebody down: my employers, my children, my husband, and my own dreams. But I kept at it, until I found what suited me and my absolute commitment to have a family. But it was always a compromise. I gave up my glamorous life as foreign correspondent for the more solitary life of a writer. There were unexpected rewards, however, and I think for me it was the right call. I just couldn’t bear to be away from my kids when they were little. It’s never perfect and all I can say is, keep at it and be flexible. Some of the things we women undertake, I wouldn’t trade for any amount of professional success. I mean the human connections we form, the friendships, which take time, and of course becoming mothers, and not just at the margins of our careers. I wouldn’t give up any of these things for longer office hours. 3) If you were a young foreign correspondent today, where would you most like to be reporting from and why? Today, I would love to be covering the unfolding drama of the Middle East as populations long oppressed by dictators demand their rights – rights we have taken for granted for centuries. It is an uncertain and sometimes violent passage, but it is historic and I wish I were covering it. 4) When you began writing for The Atlantic you recall feeling that print journalism was more satisfying than television. Why? Do you feel the same way today? Print journalism – especially long form, such as writing for The Atlantic Monthly, and then ultimately writing books, has given me much greater satisfaction that the more elusive, adrenaline-charged reward of broadcast journalism. I can open any of my books and read a passage whenever I feel like it, and know that I have written something no one else has – and that it is permanent. 5) In writing another article for The Atlantic, you discovered you are Jewish. What was that revelation like? How did it change your perception of yourself and did it change your perception of global politics at all? I was actually thrilled to discover my Jewish roots while researching my biography of Raul Wallenberg. I had come to the US as a little girl leaving behind my Hungarian roots and painful (my parents were jailed as American spies when I was six years old, and I did not see them for almost two years) family history, in exchange for a chance at a new life here in the United States. But I always yearned for a deeper sense of identity and sensed that something was missing from my family narrative – that our history did not begin in the United States. My parents chose to withhold our Jewish roots as they had been made to suffer for them in anti-Semitic, pre-World War II Hungary. In fact, I discovered that my maternal grandparents had perished in Auschwitz in 1944. This was a shock to learn at age thirty. I believe it is always a mistake to withhold essential family history from our children. I have tried to be very open with my own. My discovery of my Jewish roots at a rather advanced age did not lead me to a more religious life, but certainly to a greater awareness of humanity’s capacity for evil, as well as the need for tolerance of cultural and ethnic differences. Perhaps I had those qualities before, but my personal discoveries enhanced those innate sympathies. As I accompanied my husband, Richard Holbrooke, during his successful mission to end the horrific violence in Bosnia, I became even more aware of the need for understanding and for energetic diplomacy in stopping ethnic conflicts before they turn genocidal. 6) Were your children interested in journalism? Would you advise young people to go into journalism today? Journalism is a great and adventurous way of life. I have seen parts of the world I would never have been exposed to had I started out as an author, right out of college. The ten years I spent as a reporter enlarged my worldview immeasurably. So, yes, I would recommend it for anyone looking for adventure. It is not a particularly secure way of life, however, and not always easy to combine with a good family life. That is why I am happy I switched to writing books a couple of decades ago. But I maintain my involvement in the world through my pro bono work with such humanitarian organizations as the Committee to Protect Journalists, the International Rescue Committee, and Human Rights Watch. I chaired the International Women’s Health Coalition for five years. My daughter is working in the humanitarian field and has just finished two years of relief work in Haiti. My son is writing his first book. So I guess the apple hasn’t fallen too far from the tree. 7) You quote Hemingway’s A Moveable Feast at each chapter opening. Is this an important book for you? What do you like about it? Do you like other Hemingway works? As I wrote in Paris – A Love Story, Hemingway casts a huge shadow over all other American writers who have written from and about Paris. As I describe in my own book, Hemingway’s interaction with Parisians is very limited and Paris is really mostly a backdrop for his novels about expatriate life. I hugely admire his disciplined style, his tightly woven plots and sometimes heartbreaking longing for what was lost along the way – especially in A Moveable Feast. 8) What are you most proud of accomplishing in your life? What do you think Richard was most proud of? And what was it for Peter? I am most proud of having raised two really great kids! Same goes for Richard and Peter. 9) You write candidly about your affair with a man in Budapest while married to Richard, and the allure of a simpler life and a connection to your Hungarian roots. Is this draw towards a simpler life something that you’ve struggled with or felt torn between for all of your professional life? Do you still feel attracted to a less high-powered, public lifestyle? Paris – A Love Story is an honest account of my life and therefore I felt I owed the reader an account of the period when I allowed a friendship with another man to go too far. It was a mistake but it reinforced my commitment to my husband and his to me. We had tested our bond. That friendship grew out of my need for a more quiet and a more European life. The life I am living now, since the sudden death of my beloved Richard, a public man with a super-charged life is a more quiet life. I set my own pace now and take more time to savor simpler pleasures, the colors, smells and textures of things – whether in Paris or in New York. I miss certain aspects of my life with Richard, but mostly I just miss him. I am learning to live on my own for the first time. The freedom is quite exhilarating and I am learning slowly to cope with the occasional loneliness. Friends help tremendously! 10) Have you considered moving to Paris for good? I am too American to live full-time in Paris. But I certainly love having a part-time Parisian life, especially as my sister lives there and my children have also come to love the city. 11) Are there any other cities in the world you love as much, or almost as much, as Paris? I also love my hometown of Budapest – another exquisitely beautiful city. But New York is my town now. 12) After Richard’s death, you return to Paris and write eloquently about your changes in old patterns and the shift in your self-definition when no longer a part of a couple. You write that you observed yourself and your actions as you would a stranger (p. 162). How do you perceive yourself now? I do observe myself now as I would a stranger. I cheer myself on when I handle a rough situation with a degree of grace, and channel Richard when I mess up and can hear him telling me, You blew that one, Kati. I feel as if I am just now, at this ripe stage in my middle age, coming into my own. Life alone is much more challenging than when you have someone always watching your back. Of course, I was very lucky to have been part of such a close couple, but in a strange way, I feel lucky to have a chance to test myself now. I am a work in progress! 13) What are you working on these days? I am doing a great deal of traveling now as Paris – A Love Story has had a very warm reception around the country. This is tremendously gratifying as it was not a pain-free process writing it. I am beginning to think about my next book (#9!). But for now, I am enjoying talking about this one, and meeting people who also love Paris, or have had their hearts broken, or are going through some sort of an unexpected transition in their lives. There seem to be many of us out there! “Like . . . Didion, Joyce Carol Oates. . . . The book, short and intimate, reads like the wind from the urgency of the opening scene." "[A] must-read . . . enthralling"
“Kati Marton has lived a thrilling and turbulent life. … She fell in love with and married two famous men. … She has been an eyewitness to history in all its cruelty. … [I]n this memoir … she grapples with an unexpected new stage of life: widowhood. … [A] delicious read by a well-connected author." "Kati Marton is a writer of great clarity and grace. 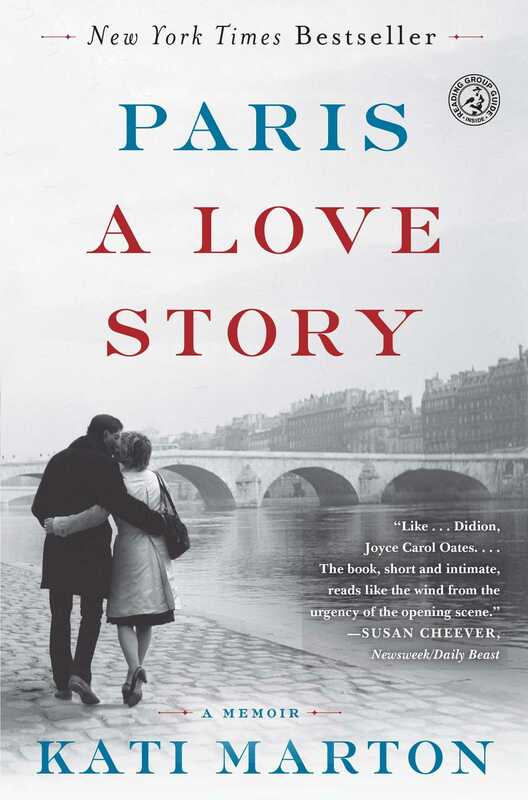 Paris: A Love Story is a revealing memoir about the contours of her own humanity, rendered with precision and honesty. It is a memorable story of love, loss and landscape that is as expansive as her remarkable life."